Our staff will welcome you to our office and will help you with anything you may need. The first visit typically is a comprehensive examination where we will discuss your medical history and examine your dental health. If you have had X-rays taken by your dentist, you may request that they be sent to our office in advance or you may bring them in with you. If necessary, additional x-rays may be taken at our office. As an emphasis on dental health, oral hygiene instructions will be given at your consultation appointment. What is gum disease and what are the symptoms? If left untreated, it can lead to tooth loss. 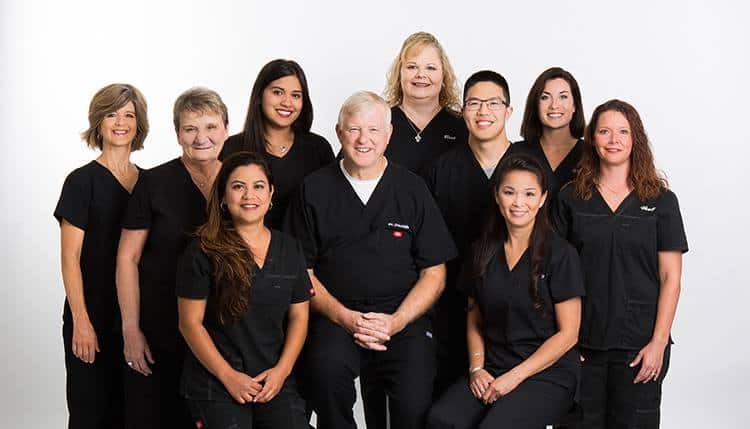 We will do a comprehensive examination to accurately assess the health of your gums and discuss how we can work together to resolve your gum disease. There are several negative consequences of missing teeth. Missing teeth can cause drifting of the teeth which can cause changing of the bite and loss of bone in that area. Allowing teeth to be missing for an extended period of time can reduce the ability to properly replace the teeth. Missing teeth can also affect your speech and esthetics which can result in a negative emotional response. What are the options for replacing teeth? Advantages of a Single Implant vs Bridge or DentureThere are a variety of options for replacing teeth depending on the individual’s situation. Options include dental implants, dentures, and bridges. There are pros and cons to each option and we would be happy to discuss those options with you. A dental implant is a medical device that acts as an artificial tooth root for a replacement tooth. As a single tooth replacement, it is a standalone replacement tooth and does not depend on the neighboring teeth for support. On the contrary, a bridge requires removal of tooth structure from the adjacent teeth. More information on dental implants can be found here (link to dental implant page). It is important to know that each patient’s situation and priorities are different. We will work with you to help you understand your options and to determine if a dental implant is the best tooth replacement option for you. We utilize advanced technology such as a Cone Beam Computed Tomography (CBCT) machine to allow us to place a dental implant safely and accurately.